As you may know, I often reference how lucky I am to work with an incredible faculty. Being a pragmatist, I decided to take advantage of their talents and insights by inviting some of my colleagues to guest blog for me. 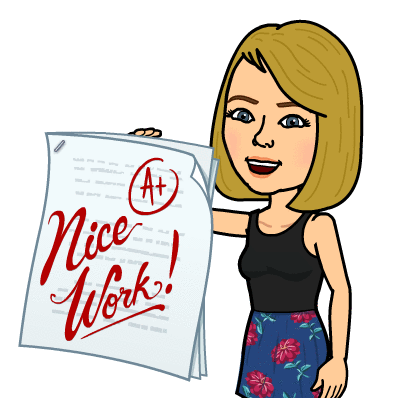 My first guest blogger is Ms. Elise Krogman, first-year Science Teacher. I know you will appreciate her insights as I did. The last time I wrote a blog post, it was 2013, and I was backpacking for almost two months across Europe. 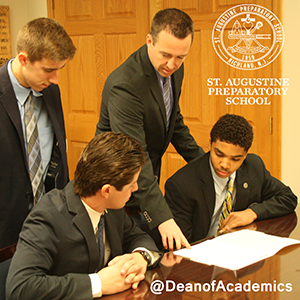 Now, I find myself sitting down to write a guest blog post for the Dean of Academics at St. Augustine Prep (The Prep) about my first year teaching here. While the two experiences could not seem more different, in reality they are actually quite similar. In both situations, I was travelling by myself to a land unknown, and relying on the help and kindness of strangers to guide me through the upcoming months of my life. What I didn’t realize was how familiar these places would feel after what felt like no time at all, and how these strangers would come to be some of my closest friends and role models. Being a female teacher in an all-boys school gives me quite the advantage when it comes to lavatory utilization. I learned that TCP is not the code for an illegal substance that the kids are working to acquire; it’s tri-colored pasta, and it’s amazing– thanks Chef Berti! Along with my students, I’ve come to understand that a hoodie, a quarter-zip, a sweatshirt, a pullover, and a zip-up are very different things. Dress code issues—ongoing. Fencing is not just something you put around your yard (and those swords we use are actually referred to as weapons). And sometimes, depending on the schedule. . . a Friday can be a Wednesday and a Tuesday can be a Thursday. The list goes on. On a more serious note, the most valuable lessons I learned this year were surely not those that I had envisioned. In September, I would have told you that by the end of the year I would have hoped to learn the perfect way to manage a classroom, how to effectively teach to all different learning styles, and how to have students retain most of the information taught from September to May. Oh, and of course, I would have learned to do all of this while my students were having fun. Yes, FUN. Do not get me wrong. In the classroom, the material comes first 95.8% of the time. However, I was not asked to write this post about the teaching strategies I used—what worked and what didn’t. I was only asked to reflect on my first year at the Prep. So here it is. Perhaps, a true story and me getting to the point would be more appealing. He walked over to my desk and said, “Miss K, can I ask you something?” He sat down and asked if he could ask me for some relationship advice. Relationship advice? Me? Am I hearing this correctly? I wasn’t sure he even knew how to spell my last name, let alone considered me someone he would ask for advice. Yet here he was, a half hour before classes started, asking me for help. He prefaced his question by saying that I was a young, female teacher, that he respected my opinion, and that I probably had dealt with these types of situations before. He wanted to run a scenario by me and know what I would do. In that moment, my entire attitude changed. Suddenly, I had all of the time in the world. I listened to him and gave him the best advice that I was able to give. As he walked out, I held back a tear and thought to myself, “This is what it means to be a teacher.” You see, the most important lesson I learned this year is not about the value of technology in the classroom (sorry, Mrs. V. – Coordinator of Faculty Development). The most important lesson I learned is that it’s what you do the other 4.2% of the time that determines your ultimate success. So yes, I take the time to talk to my students about fantasy football, “promposals”, their athletic endeavors, new albums, and even Snapchat. By doing so, I’ve been able to build trusting, multi-faceted relationships with my students. And when students can relate to me and trust that I have their best interests in mind, anything is possible.